A book can make a child laugh or feel clear-and-happy-headed as he follows a simple rhythm to its logical end. It can jog him with the unexpected and comfort him with the familiar, lift him for a few minutes from his own problems of shoelaces that won’t tie and busy parents and mysterious clock-time, into the world of a bug or a bear or a bee or a boy living in the timeless world of story. If I’ve been lucky, I hope I have written a book simple enough to come near to that timeless world. In 1952, Margaret traveled to Paris to celebrate the publication of Mister Dog in French. It was there that she died unexpectedly at the age of forty-two of an embolism that occurred during routine surgery. From March 29 to July 10, 2005, The Eric Carle Museum of the Picture Book featured an exhibit entitled “Margaret Wise Brown and Her Illustrators.” Brown was “a pivotal figure in the evolution of the picture book” who “…championed the careers of a generation of illustrators; and, by cross-fertilizing ideas drawn from progressive education and the modernist avant-garde, transformed the picture book into a vibrant contemporary art form.” This exhibit showed the largest selection of art from Brown’s books ever assembled and included works by Clement Hurd, Leonard Weisgard, Garth Williams, Esphyr Slobodkina, and many others. Many of Margaret Wise Brown’s books can be found in the Alumnae Author display cabinet in the Helen Temple Cooke Library. Bechtel, L.S. 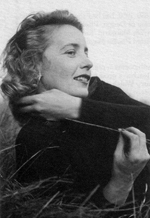 “Margaret Wise Brown, ‘Laureate of the Nursery. '” Horn Book. June 1958: 172-186. Margaret Brown, photograph. Dana Hall Archives, Wellesley, MA. Silvey, Anita. Children’s Books and Their Creators. Boston: Houghton Mifflin, 1995.